Equipment Management (EM) Solutions is supported by world-class technology that collects fleet data and helps you make decisions based on equipment location, fuel burn, utilization and more. Supported by a dedicated EM Advisor from Western States Cat, EM Solutions can help your fleet achieve maximum efficiency. With EM Solutions, you and your dedicated EM Advisor from Western States Cat can use your machine data to build a more productive and efficient operation. EM Solutions was designed to save you time and money. 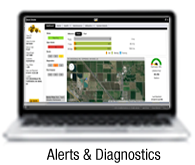 It tracks your inventory, validates machine health, and so much more.